The weekend was beautiful — with one day spent at the beach. So now Labor Day has passed and fall is on it’s way, right? Sure didn’t feel like it today but they say it will be cooler by the end of the week. I guess my body clock says it is time for fall because I had the hankering to make some soup this weekend and so I did. A nice big pot of chicken soup! Now we have a number of packages of it waiting for us in the freezer when the first chilly night arrives for a cozy soup and sandwich supper. 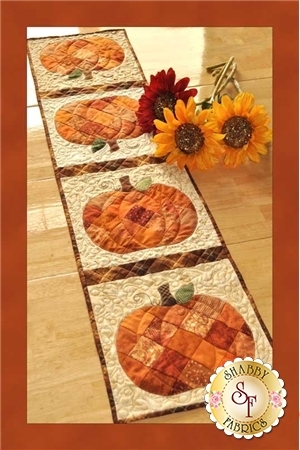 I also have the urge to start decorating for the fall season and one of the things on my list of things to make is this tablerunner: It’s from Shabby Fabrics and I’ve had the pattern for a year and didn’t get to it last fall but I really want to get it on my table this year. I also think just making one block of it would make a cute wallhanging for above my desk at work. Hmmmm, think I’ll add that to my list. So cool weather ….. make your appearance. I am ready for fall things. Mums, pumpkins, the deep colors of fall leaves, football, the smell of wood burning from fireplaces and wood burning stoves as you take a nice walk on a brisk day and then relaxing with a good book and a cup of tea by a nice fire in the fireplace on a chilly night. Anybody else ready for the seasonal change? Can you tell that I am? Have a wonderful week everyone. Bye for now.